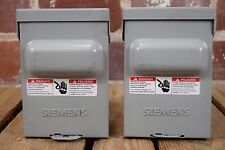 You are purchasing this brand new SIEMENS WN2060 60A Non-Fusible Disconnect. General Duty 60 Amp 240 Volt Double Pole Outdoor Non Fusible Safety Switch New General Duty Safety Switches are intended for applications where reliable performance and continuity of service are needed, but where duty requirements are not severe and usual service conditions prevail. These switches are intended for use primarily with supply circuits rated 240V AC or less where the available fault current is less than 100,000A when used with Class R or T fuses or 10,000A max when used with Class H fuses. Single cover interlock. 240V, single phase, 2 wire, non-fusible safety switch. Visible blade, double-break switch action. Electrical Product Type: Switch. We have multiple quantities available. Product Depth (in.). 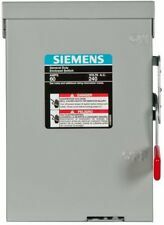 Siemens General Duty 60-Amp 240-Volt Double-Pole Outdoor Non-Fusible Safety Switch General Duty Safety Switches are intended for applications where reliable performance and continuity of service are needed, but where duty requirements are not severe and usual service conditions prevail. These switches are intended for use primarily with supply circuits rated 240V AC or less where the available fault current is less than 100,000A when used with Class R or T fuses or 10,000A max when used with Class H fuses. Single cover interlock. 240V, single phase, 2 wire, non-fusible safety switch. Visible blade, double-break switch action. Electrical Product Type: Switch. All enclosures are outdoor rated, single phase, and are either 30 or 60 Amp rated. Padlocking provisions help prevent against unauthorized access. 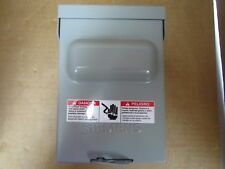 Options include steel or plastic enclosures, pull out or sliding switch disconnect, fusible or non-fused, and options with GFI receptacles installed. Single cover interlock. Unique enclosure design that adds rigidity and strength, its rolled edge prevents cuts and scrapes to conductors and to installer's hands. 240V, single phase, 2 wire, non-fusible safety switch. Single cover interlock. 240V, single phase, 2 wire, non-fusible safety switch. Visible blade, double-break switch action. Safety Switch Type: Safety. If there's a problem, just let us know and we fix it. Single cover interlock. 240V, single phase, 2 wire, non-fusible safety switch. Visible blade, double-break switch action. Electrical Product Type - Switch. 60 Amp, 2-Pole, 240V with Compact design. Service Entrance labeled with Solid Neutral & Copper Bus. Single cover interlock. 240V, single phase, 2 wire, non-fusible safety switch. Visible blade, double-break switch action. Electrical Product Type - Switch. Unique enclosure design that adds rigidity and strength, its rolled edge prevents cuts and scrapes to conductors and to installer's hands. Single cover interlock. 240V, single phase, 2 wire, non-fusible safety switch. Visible blade, double-break switch action. Safety Switch Type: Safety. Electrical Product Type: Switch. Single cover interlock. 240V, single phase, 2 wire, non-fusible safety switch. Visible blade, double-break switch action. Electrical Product Type: Switch. Product Depth (in.). Product Height (in.). Rainproof pullout switch. 1 phase type 3R enclosure. We are dedicated to keeping architectural salvage and building materials out of our landfills. Reuse, Recycle, Repurpose. We are devoted to preserving historical architectural building materials. 60 Amp fusible AC disconnect. Single phase 120/240-Volt rated. Bedford, Texas 76021. 2905 Crystal Springs. Can't find what you want?. No problem. Once in a while mistakes happen and this is an opportunity for us to make it right. Manufacturer: Siemens Model: 3SB3243-0AA61 Product Type: Illuminated White Pushbutton Max Voltage: 400VAC Current: 10A LED Voltage: 130VAC Contacts: 1 NC / 1 NO Made In: Germany *Product removed from package for pictures*. Model Number: WN2060. If your item is received in a different condition than stated (DOA, not working properly etc. QTY-3 2lbs 7oz SH 08.24.2017 10.06am. USED, but in good working condition. Removed from closed plant. ). We apologize in advance for any inconvenience this may cause you. The color of the photo may vary from the actual product due to translation and reproduction limitations of photography. SHELF 51-1520(1) . FLUSH PUSH BUTTON SWITCH. THE ITEM MAY HAVE BEEN OPENED BUT HAS NOT BEEN USED.